This dazzling 14KT White Gold Diamond Engagement Ring options a extravagant 0.35CT center spherical Cut diamond, for a complete diamond weight of 1.35 CTW. 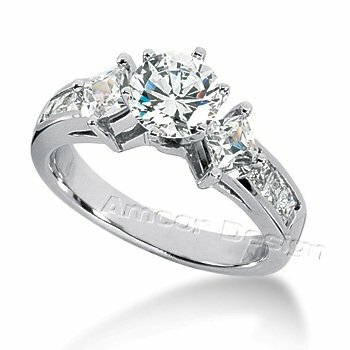 All diamonds are hand selected to match in color, size and quality, they're rated as SI2-SI3 clarity and HI in color. The diamonds on this ring have exceptional brilliance and are set on lustrous 14KT White Gold with a swish high polished end. This ring ships with a deluxe jewellery box and a certificate of authenticity.